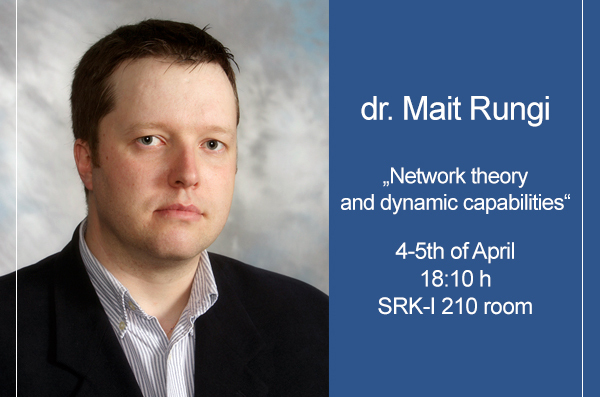 This year on 4th and 5th of April at 18:10 o‘clock in SRK-I 210 room by Management department invitation will be visiting professor dr. Mait Rungi. He will make a lecture and practical tasks in the topic ‚Network theory and dynamic capabilities’. Dr. Mait Rungi is a Professor at the Tallinn University of Technology (Estonia). He has over ten years of experience in both academia and industry, holding positions including Chief Information Officer (CIO), Team Manager, and Project Manager. His current strategic-management research interests include dynamic capabilities, absorptive capacity, and behavioral strategy. His publications have appeared in various journals and conference proceedings. He holds a DSC from Lappeenranta University of Technology (Finland).